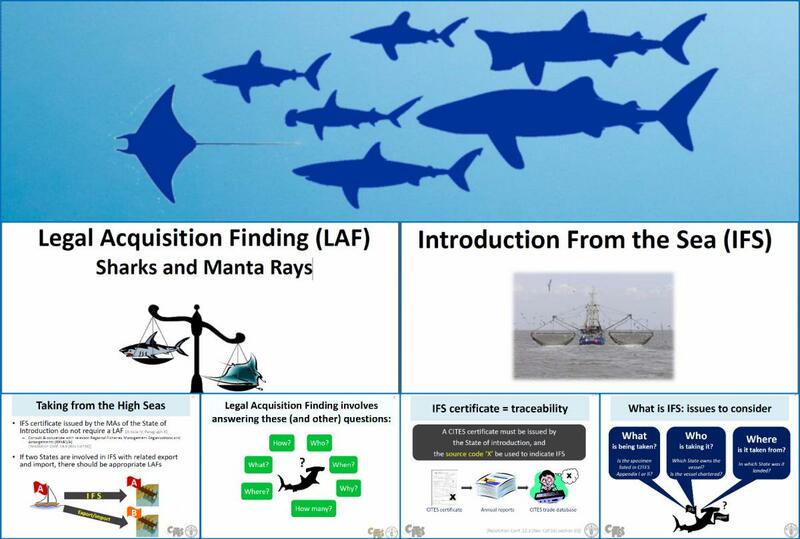 20 October Geneva/Rome – With the finalization of two new presentations on the topics “legality” and “introduction from the sea” (IFS), CITES has now completed a set of standard presentations on topics pertaining to the CITES shark and manta ray listings. The presentations are designed to meet the needs of a diverse audience and they can be further adapted and used by all Parties and stakeholders as training materials. Part of the training materials were created in response to Decision 16.52, which states that “the Secretariat shall develop capacity-building tools and materials for use by Parties related to the implementation of the Convention for specimens taken from the marine environment not under the jurisdiction of any State”. The new training materials will also help the Parties to better understand issues concerning legality and IFS in implementing CITES-listed species. The new training materials were produced within the framework of the EU-CITES Project “Strengthening capacity in developing countries for sustainable wildlife management and enhanced implementation of CITES wildlife trade regulations, with particular focus on commercially exploited aquatic species”, and in close collaboration with the UN Food and Agriculture Organization (FAO).